King of the Pippins is a widely-grown apple from the Victorian period. It is very typical of the "reinette" style apple, with its flushed orange skin and firm rather than crisp flesh - quite different to the modern supermarket apple. King of the Pippins is a versatile apple, which is probably the main reason for its success. Although usually considered a dessert variety, it can also be used for cooking - particularly French-style patisseries, since the slices keep their shape when cooked. It is a good juicing apple too, the juice has a good robust flavour and can also be used in cider blends. Please fill in the details below and we will let you know when King of the Pippins apple trees are back in stock. 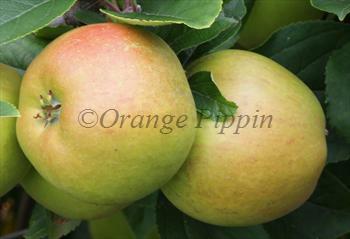 King of the Pippins is in flowering group 4. King of the Pippins is partially self-fertile, but fruiting will be improved if there is a compatible tree of a different variety nearby. King of the Pippins is a good and reliable cropper. It grows in a compact neat fashion. Disease resistance is fairly good. The origins of King of the Pippins are not certain, but it was first recorded around 1800 in London, where it was introduced by a nurseryman, Kirke of Brompton. It almost certainly comes from France where it is known as Reine des Reinettes, but there are many other synonyms for this variety.